$1,296.00 Ships within 24 hours. 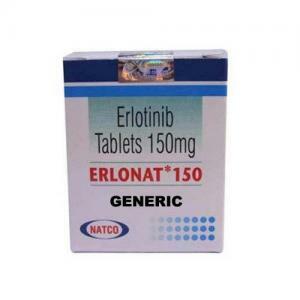 USES OF Erlotinib : Erlotinib is used to treat lung and pancreatic cancer. It works by slowing or stopping the growth of cancer cells. Before using Erlotinib : Before taking erlotinib, tell your doctor or pharmacist if you are allergic to it; or if you have any other allergies. This product may contain inactive ingredients, which can cause allergic reactions or other problems. Talk to your pharmacist for more details. 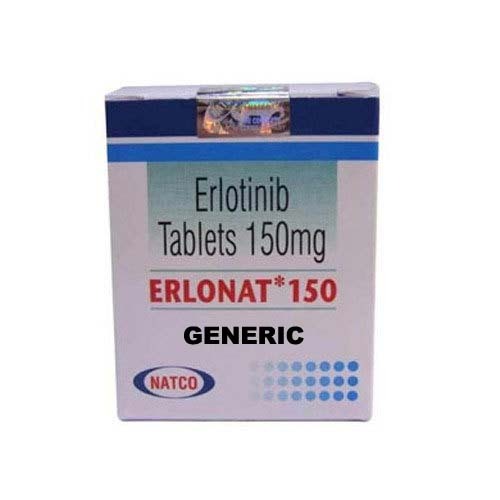 HOW TO USE Erlotinib : Take this medication by mouth on an empty stomach (at least 1 hour before or 2 hours after a meal) as directed by your doctor, usually once daily. The dosage is based on your medical condition, response to treatment, and other medications you may be taking. Be sure to tell your doctor and pharmacist about all the products you use (including prescription drugs, nonprescription drugs, and herbal products). Medications that lower stomach acid (such as antacids, H2 blockers including ranitidine) may prevent erlotinib from working. Ask your doctor or pharmacist how to use these medications safely with erlotinib. Avoid eating grapefruit or drinking grapefruit juice while using this medication unless your doctor or pharmacist says you may do so safely. Grapefruit can increase the chance of side effects with this medicine. Ask your doctor or pharmacist for more details. Use this medication regularly to get the most benefit from it. To help you remember, take it at the same time each day. SIDE EFFECTS OF Erlotinib : Diarrhea, dry skin, muscle/joint pain, mouth sores, unusual eyelash growth, or eye dryness/redness/irritation may occur. Diarrhea can be severe. In some cases, your doctor may prescribe medication to relieve diarrhea. If any of these effects last or get worse, tell your doctor or pharmacist promptly. Tell your doctor right away if you have any serious side effects, including: signs of kidney problems (such as change in the amount of urine), signs of liver disease (such as nausea/vomiting that doesn't stop, loss of appetite, stomach/abdominal pain, yellowing eyes/skin, dark urine), signs of dehydration (such as extreme thirst, muscle cramps, dizziness, fainting), redness/swelling around the nails, black stools, vomit that looks like coffee grounds, easy bleeding/bruising, unusual tiredness, eye pain, vision changes. Get medical help right away if you have any very serious side effects, including: new or worsening shortness of breath or cough, chest/jaw/left arm pain, weakness on one side of the body, trouble speaking, confusion, seizures. 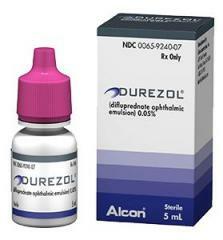 Erlotinib can commonly cause a mild rash that is usually not serious. However, you may not be able to tell it apart from a rare rash that could be a sign of a severe allergic reaction. Get medical help right away if you develop any rash. PRECAUTIONS WHEN USING Erlotinib : Before using this medication, tell your doctor or pharmacist your medical history, especially of: liver disease, kidney disease, stomach/intestinal disease (such as ulcers, diverticulosis). This medicine may cause stomach bleeding. Daily use of alcohol while using this medicine may increase your risk for stomach bleeding. Limit alcoholic beverages. Sunlight may worsen any skin reactions that may occur while you are taking this drug. Limit your time in the sun. Avoid tanning booths and sunlamps. Use sunscreen and wear protective clothing when outdoors. Tell your doctor if you are pregnant or plan to become pregnant. You should not become pregnant while using erlotinib. Erlotinib may harm an unborn baby. Ask about reliable forms of birth control while using this medication and for 1 month after stopping treatment. If you become pregnant, talk to your doctor right away about the risks and benefits of this medication. It is unknown if this drug passes into breast milk. Because of the possible risk to the infant, breast-feeding while using this drug and for 2 weeks after stopping treatment is not recommended. Consult your doctor before breast-feeding. DRUG INTERACTIONS OF Erlotinib : Drug interactions may change how your medications work or increase your risk for serious side effects. This document does not contain all possible drug interactions. Keep a list of all the products you use (including prescription/nonprescription drugs and herbal products) and share it with your doctor and pharmacist. Do not start, stop, or change the dosage of any medicines without your doctor's approval. Some products that may interact with this drug are: "blood thinners" (such as warfarin), drugs that lower stomach acid (such as proton pump inhibitors including omeprazole). Check all prescription and nonprescription medicine labels carefully since many medications contain pain relievers/fever reducers (aspirin, NSAIDs such as ibuprofen or naproxen) which may increase your risk for stomach bleeding while you are taking erlotinib. However, if your doctor has directed you to take low-dose aspirin to prevent heart attack or stroke (usually at dosages of 81-325 milligrams a day), you should keep taking the aspirin unless your doctor instructs you otherwise. Ask your doctor or pharmacist for more details. OVERDOSE OF Erlotinib : If someone has overdosed and has serious symptoms such as passing out or trouble breathing, call a poison control center right away. MISSED DOSE OF Erlotinib : If you miss a dose, take it as soon as you remember. If it is near the time of the next dose, skip themissed dose. Take your next dose at the regular time. Do not double the dose to catch up. STORAGE OF Erlotinib : Store at room temperature away from light and moisture. Do not store in the bathroom. Keep all medications away from children and pets. Additional information : DO NOT SHARE THIS MEDICINE with others for whom it was not prescribed. DO NOT USE THIS MEDICINE for other health conditions. KEEP THIS MEDICINE out of the reach of children. IF USING THIS MEDICINE FOR AN EXTENDED PERIOD OF TIME, obtain refills before your supply runs out.